Reverend George A. Seck, an Estonian, was born in 1893, in Russia. He was married to Ruth and together they had at least four sons. He was a travelling Lutheran evangelist. In 1947, he was working at the European Volunteer Workers’ transit camp at Inskip, near Preston. He also spent some time in Poland and Britain around and after World War II. He eventually came to Canada some time after 1947. He lived in various places in Canada such as Winnipeg, Manitoba and Ceepeecee, British Columbia. An important part of his ministry was gospel songs. He owned forty vinyl recordings and a portable, wind up gramophone, which he took with him in his travels. He died in 1979. The material in this collection was collected and produced by Reverend Seck. It was donated after his death to the Centre by his son, Ernest John Wesley Seck, on April 21, 1981. The material in this collection contains two series of material. Included are 1) George Seck’s Personal Papers and 2) George Seck Gospel Recordings. The material in this collection is in various languages. They include English, German, Russian, Cree, Welsh, Estonian, Spanish, Danish, Finnish, Italian, Norwegian, Japanese, French, Cantonese, and Portuguese. Described by Conrad Stoesz December 9, 1999. 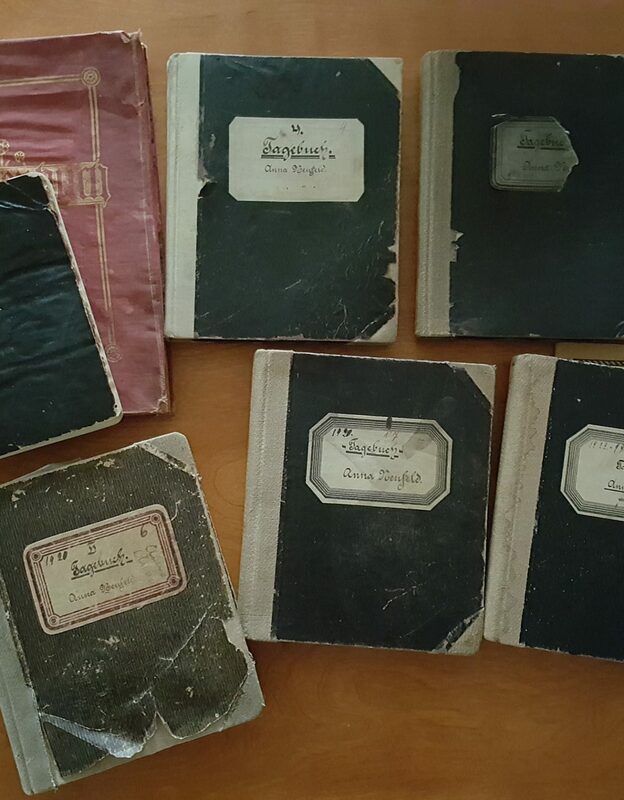 This series contains scribblers of handwritten gospel songs, diaries, and scrapbooks. In these items are many loose articles, letters, and songs. The material in this collection is mainly in English, but other languages also exist. These include French, Cree, Welsh, Russian, German, Spanish, and Estonian. Location: Personal collection “S”, George A. Seck. Series II. George Seck gospel recording collection. 40, 78 rpm, vinyl recordings. This series contains 40, 78 rpm vinyl records and a portable gramophone. The records appear to have come from Gospel Recordings Incorporated, Los Angeles, California. The postage states that the material was received by Seck in September 1956, and a smaller amount in May of 1957. The records were ordered by Seck while he was living in Ceepeecee, British Columbia, and sent to him free of charge by the Gospel Recordings company. The material is in many languages which include English, Italian, German, French, Finnish, Russian, Norwegian, Japanese, Cantonese, and Portuguese. Included in this series is a wind up gramophone on which these records were played. The Bible that Didn’t Burn. – [1938?]. Jubel – och Hjärtetoner, hymn book. – [194-?]. Scribbler of Songs and Choruses, English, French, Cree, Welsh, and Russian. – [196-?]. Scribbler of English Hymns and Choruses. – [196-?]. Scribbler of songs and choruses, German, Russian, Spanish, Estonian. – [196-?]. Diary. – 1947, 1955, 1956, 1957, 1963; predominantly 1955–1957. Scribbler of gospel songs. – 1971, 1973, 1974, 1976. Scribbler of native language (Nootka) studies and gospel songs. – 1955, 1961. Scribbler of Russian material. – [196-?]. Diary of George and Ruth Seck. – 1970. Book shell filled with loose papers. – 1954, 1967, 1974, 1976. Scribbler recording book sales. – 1966, 1967. Scrap book “So Great a Crowd of Witnesses”. – 1954, 1955, 1957, 1958, 1961, 1962, 1965, 1966, 1970, 1977. – Note: Included are five photographs. unknown. – 1962, Jonathan Paul. – [192-? ], Leland Wang. – [196-? ], Mrs. Asiedu and Jonathan. – 1956, James D.H. Hall. – [194-?]. NPH-24–01 [George Seck Gospel Recordings Collection] : Russian : Side A, Putj Mira : The Way to Peace, #49–3A: Side B, Christos-Nash Posrednik = Christ Our Mediator, #49–3B. – 1 disc. (21cm.) 78 rpm, mono. – [Before 1956]. NPH-24–02 [George Seck Gospel Recordings Collection] : German : Side A, Jesus Kommt Wieder, #24–9A: Side B, Das Licht Der Weihnacht = The Christmas Light, #24–9B. – 1 disc. (25cm.) 78 rpm, mono. – [Before 1956]. NPH-24–03 [George Seck Gospel Recordings Collection] : Italian :Side A, La Coscienza del Peccato #LR-1055–7A: Side B, La Buona Notizia, #LR-1055–8B. – 1 disc. (25cm.) 78 rpm, mono. – [Before 1956]. NPH-24–04 [George Seck Gospel Recordings Collection] : Danish : Side A, Sande Ord Om Gud : True Words about God, #337–1A: Side B, Gud’s Plan For Frelse = Plan of Salvation, #337–1B. – 1 disc. (25cm.) 78 rpm, mono. – [Before 1956]. NPH-24–05 [George Seck Gospel Recordings Collection] : Finnish : Side A, The Love of God, #142–5A: Side B, Before The Throne, #142–5B. – 1 disc. (25cm.) 78 rpm, mono. – [Before 1956]. NPH-24–06 [George Seck Gospel Recordings Collection] : Italian : Side A, Iddio Salva!, #LR-1055–5A: Side B, La Soluzione Del Problema Piu’ Importante, #LR-1055–6B. – 1 disc. (25cm.) 78 rpm, mono. – [Before 1956]. NPH-24–07 [George Seck Gospel Recordings Collection] : Russian : Side A, Full Surrender, #49–6A: Side B, The Stormy Sea of Life, #49–6B. – 1 disc. (25cm.) 78 rpm, mono. – [Before 1956]. NPH-24–08 [George Seck Gospel Recordings Collection] : Russian : Side A, The Ten Virgins, #49–5A: Side B, When I Met My Saviour, #49–5B. – 1 disc. (25cm.) 78 rpm, mono. – [Before 1956]. NPH-24–09 [George Seck Gospel Recordings Collection] : Side A, What a Wonderful Story to Tell, #22–8A: Side B, Ye Must Be Born Again: #22–8B . – 1 disc. (21cm.) 78 rpm, mono. – [Before 1956]. NPH-24–10 [George Seck Gospel Recordings Collection] : Finnish : Side A, The Clean Heart, #142–1A: Side B, The Closed Door, #142–1B. – 1 disc. (25cm.) 78 rpm, mono. – [Before 1956]. NPH-24–11 [George Seck Gospel Recordings Collection] : Finnish : Side A, Isaiah 53, #142–2A: Side B, The Lord in the Storm, #142–2B. – 1 disc. (25cm.) 78 rpm, mono. – [Before 1956]. NPH-24–12 [George Seck Gospel Recordings Collection] : Finnish : Side A, The Blood of Christ, #142–3A: Side B, Nailed to the Cross, #142–3B. – 1 disc. (25cm.) 78 rpm, mono. – [Before 1956]. NPH-24–13 [George Seck Gospel Recordings Collection] : Italian : Side A, Una Grande Riunione e’ Annunziata, #LR-1055–11A: Side B, Gesu’ Viene, #LR-1055–12B. – 1 disc. (25cm.) 78 rpm, mono. – [Before 1956]. NPH-24–14 [George Seck Gospel Recordings Collection] : Italian : Side A, La Bibbia, #LR-1055–1C: Side B, Contemporanei Di Gesu’ E Degli Apostoli, #LR-1055–2D. – 1 disc. (25cm.) 78 rpm, mono. – [Before 1956]. NPH-24–15 [George Seck Gospel Recordings Collection] : Italian : Side A, Che Cosa e’ il Natale Per Te?, #LR-1055–9A: Side B, IL Tempo Fugge E Ti Avverte, #LR-1055–10B. – 1 disc. (25cm.) 78 rpm, mono. – [Before 1956]. NPH-24–16 [George Seck Gospel Recordings Collection] : German : Side A, Der Name Jesus = The Name of Jesus, #24–8A: Side B, Die Kostbare Perle = The Pearl of Great Price, #24–8B. – 1 disc. (25cm.) 78 rpm, mono. – [Before 1956]. NPH-24–17 [George Seck Gospel Recordings Collection] : German : Side A, When Nacht dem Abend = Beyond the Sunset, #24–7A: Side B, Wo Findet Die Seele Die Heimath, Die Ruh, #24–7B. – 1 disc. (25cm.) 78 rpm, mono. – [Before 1956]. NPH-24–18 [George Seck Gospel Recordings Collection] : Russian : Side A, Calvary Road, #49–7A: Side B, Lord God of Heaven, #49–7B/ . – 1 disc. (25cm.) 78 rpm, mono. – [Before 1956]. NPH-24–19 [George Seck Gospel Recordings Collection] : Russian : Side A, The Fiery Furnace, #49–4A: Side B, He’s Looking on You, #49–4B. – 1 disc. (25cm.) 78 rpm, mono. – [Before 1956]. NPH-24–20 [George Seck Gospel Recordings Collection] : Side A, There is a Fountain Filled with Blood, #22–7A: Side B, Absolutely Free, #22–7B. – 1 disc. (21cm.) 78 rpm, mono. – [Before 1956]. NPH-24–21 [George Seck Gospel Recordings Collection] : Norwegian : Side A, Frelsesfryd (Budskap) = Joy of Salvation, #178–3A: Side B, Vitnesbyrd, #178–3B. – 1 disc. (21cm.) 78 rpm, mono. – [Before 1956]. NPH-24–22 [George Seck Gospel Recordings Collection] : Norwegian : Side A, Den Tapte Faren (for barn) = The Lost Sheep, #178–5A: Side B, Den Tapte Slanten (for barn) = The Lost Penny (for children), #178–5B. – 1 disc. (21cm.) 78 rpm, mono. – [Before 1956]. NPH-24–23 [George Seck Gospel Recordings Collection] : Norwegian : Side A, Kom Til Meg = Come Unto Me, #178–1A: Side B, Frykt Ikke (Budskap) = Fear Not, #178–1B. – 1 disc. (21cm.) 78 rpm, mono. – [Before 1956]. NPH-24–24 [George Seck Gospel Recordings Collection] : Side A, Softly and Tenderly Jesus is Calling, #22–9A: Side B, O What A Saviour is Mine!, #22–9B. – 1 disc. (21cm.) 78 rpm, mono. – [Before 1956]. NPH-24–25 [George Seck Gospel Recordings Collection] : Japanese : Side A, Jesus Only, #96–6A: Side B, Somebody’s Here With An Aching Heart, #96–6B. – 1 disc. (21cm.) 78 rpm, mono. – [Before 1956]. NPH-24–26 [George Seck Gospel Recordings Collection] : Norwegian : Side A, Budskap ut fra Esaias 12 ’ Isaiah 12 (Message), #178–4A: Side B, Kristi Anrop Til Deg (Budskap) = Christ’s Challenge to You, #178–4B. – 1 disc. (21cm.) 78 rpm, mono. – [Before 1956]. NPH-24–27 [George Seck Gospel Recordings Collection] : French : Side A, La Nouvelle Creature (1) : Message – A New Creature, #23–11A: Side B, La Nouvelle Creature (11), #23–11B. – 1 disc. (21cm.) 78 rpm, mono. – [Before 1956]. NPH-24–28 [George Seck Gospel Recordings Collection] : Portuguese : Side A, A Ultima Hora, #47–9A: Side B, A Festa Nupcial, #47–9B. – 1 disc. (21cm.) 78 rpm, mono. – [Before 1956]. NPH-24–29 [George Seck Gospel Recordings Collection] : French : Side A, Quand je suis Faible ’ Message – II Cor. 12:10, #23–4A: Side B, Venez Au Sauveur, #23–4B. – 1 disc. (21cm.) 78 rpm, mono. – [Before 1956]. NPH-24–30 [George Seck Gospel Recordings Collection] : French : Side A, IL Faut Naitre de Nouveau, #23–6A: Side B, Nous Lui Appartenons, #23–6B. – 1 disc. (21cm.) 78 rpm, mono. – [Before 1956]. NPH-24–31 [George Seck Gospel Recordings Collection] : Russian : Side A, Derzis Zizni Vetschnoj = Lay Hold on Eternal Life, #49–4A: Side B, Derzis Zizni Vetschnoj (II), #49–4B. – 1 disc. (21cm.) 78 rpm, mono. – [Before 1956]. NPH-24–32 [George Seck Gospel Recordings Collection] : Russian : Side A, Putj Spansenija = The Way of Salvation, #49–1A: Side B, Spasenije Bozije = The Salvation of God, #49–1B. – 1 disc. (21cm.) 78 rpm, mono. – [Before 1956]. NPH-24–33 [George Seck Gospel Recordings Collection] : Japanese : Side A, The Bible is the Word of God, #96–10A: Side B, Only A Sinner, #96–10B . – 1 disc. (21cm.) 78 rpm, mono. – [Before 1956]. NPH-24–34 [George Seck Gospel Recordings Collection] : Japanese : Side A, The Broad Road, #96–4A: Side B, On the Cross of Calvary, #96–4B. – 1 disc. (21cm.) 78 rpm, mono. – [Before 1956]. NPH-24–35 [George Seck Gospel Recordings Collection] : French : Side A, Mon Temoignage, #23–1A: Side B, Viens, Ame Qui Pleures, #23–1B. – 1 disc. (21cm.) 78 rpm, mono. – [Before 1956]. NPH-24–36 [George Seck Gospel Recordings Collection] : French : Side A, La Bregis Predue, #23–5A: Side B, Le Jugement, 23–5B. – 1 disc. (21cm.) 78 rpm, mono. – [Before 1956]. NPH-24–37 [George Seck Gospel Recordings Collection] : French : Side A, Temoignage (I), #23–8A: Side B, Temoignage (II), #23–8B. – 1 disc. (21cm.) 78 rpm, mono. – [Before 1956]. NPH-24–38 [George Seck Gospel Recordings Collection] : French : Side A, Les Deux Chemins = The Two Roads, #23–9A: Side B, Le Retour De Jesus – Christ = the Second Coming, #23–9B. – 1 disc. (21cm.) 78 rpm, mono. – [Before 1956]. NPH-24–39 [George Seck Gospel Recordings Collection] : Italian : Side A, La Croce, #29–3A: Side B, Consigli Agli Scoraggiati = When Discouraged, #29–3B. – 1 disc. (21cm.) 78 rpm, mono. – [Before 1956]. NPH-24–40 [George Seck Gospel Recordings Collection] : Norwegian : Side A, En Bonn = A Prayer, #178–2A: Side B, Korsets Budskap = Message of the Cross, #178–2B. – 1 disc. (21cm.) 78 rpm, mono. – [Before 1956]. NPH-24–41 [George Seck Gospel Recordings Collection]: English : Side A, The Shepherd Saviour, #22A-1A: Side B, Christmas, #22A-1B, – 1 disc. (21 cm) 78 rpm, mono. – [Before 1956]. NPH-24–42 [George Seck Gospel Recordings Collection] : Cantonese : Side A, God’s Love, Choruses and Scripture, #13–6A: Side B, Jesus Calms The Storm, #13–6B. – 1 disc. (21 cm) 78 rpm, mono. – [Before 1956]. NPH-24–43 [George Seck Gospel Recordings Collection] : Japanese : Side A, How to Be Saved, #96–5A: Side B, Blessed be the Fountain of Blood, #96–5B. – 1 disc. (21 cm) 78 rpm, mono. – [Before 1956]. NPH-24–44 [George Seck Gospel Recordings Collection] : Russian : Side A, Christos-Mir Nasch = Christ Our Peace, #49–2A: Side B, Raduga Bozija = God’s Rainbow, #49–2B. (21 cm) 78 rpm, mono. – [Before 1956]. NHP-24–45 [George Seck Gospel Recordings Collection] : Side A, La Pascua, #52–34A: Side B, Comprado Por Sangre, #52–34B. (21 cm) 78 rpm, mono. – [Before 1956]. One wind up gramophone in a wooden case measuring 37 cm wide, 29 cm deep, and 18 cm high. Kept in reading room display case.